I’m always hearing about crimes against badgers, especially at badger setts. But in the last few weeks I’ve heard about more then usual, one of which was in my local area. A badger sett is what a badger calls home. It is usually situated in or near small clearings in woodland. A simple sett is made up of a single tunnel, with a sleeping chamber at the end. However, most setts have several entrance holes, and lots of tunnels which link up with each other. The tunnels also link up with sleeping and nursery chambers. There are numerous horrific crimes which people commit against badgers. For centuries badgers have been victims of persecution by man, and in the old days, badger baiting was a popular spectator sport. It was made illegal in 1835, but never completely died out and has become more common in the last 20 years. Badger diggers use dogs and digging equipment to take badgers from their setts. The captured badgers are then attacked by dogs for sport, whilst the spectators gamble on the performance of the dogs. Badger baiting is extremely cruel and the badgers suffer severe injuries before they are killed. The dogs are often badly injured as well. It is estimated that 10,000 badgers are killed in this way every year. Along with these disgusting offences against badgers, they are also victims of crimes such as disturbance, damage and destruction of their setts. A recent example of destruction and damage at a badgers sett was at Stevenage, Hertfordshire. The sett was bricked in and scorched which prevented the badgers getting out to find food and would of caused unnecessary suffering. Another example of a horrible act of cruelty against a badger was at a sett not far from where I live. 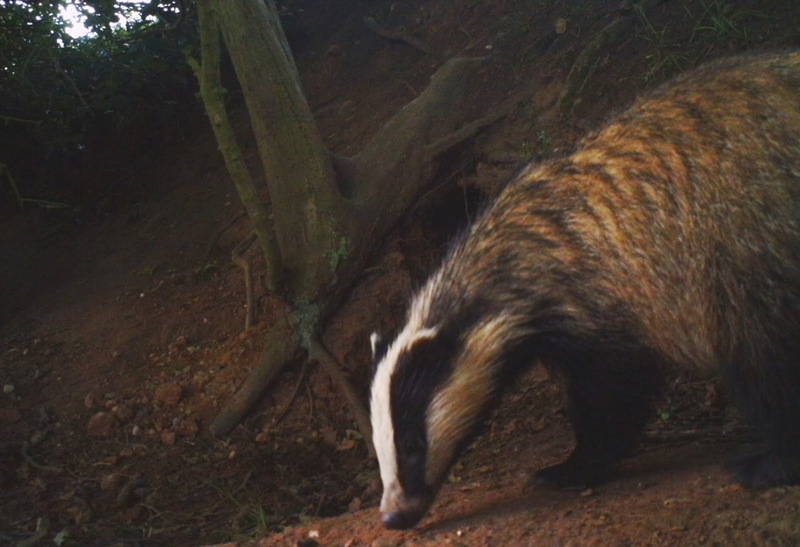 A snare was set up on a badger sett. One of the badgers got caught in the snare and slowly strangled to death as it tried to escape. These are just two examples of sick acts of cruelty against badgers. By adopting a local sett or a sett on your local patch, where you might go and watch badgers there regularly, you can keep an eye on the sett. What I mean by this is making sure there hasn’t been any recent disturbance or there isn’t anyone about that looks suspicious. Now, this isn’t a formal thing. It’s just doing something of your own back to look out for badgers and help prevent crimes against them. I have my own example of this as last year I went to a sett that I set my camera up at regularly and I noticed that some of the wholes had been filled in, trees had been cut back by the sett and overall, the sett had been disturbed. Due to this I got in touch with my local wildlife crime officer and the Staffordshire Badger Group. Even though though this was not as serious as something as terrible as badger baiting etc, it was still important to have it dealt with in case the problem progressed. Fortunately it was dealt with. Of course badgers aren’t the only species that suffer from such horrible acts of cruelty. I’m also very much looking forward to a Wildlife Crime conference that I am going to on Saturday, it’s run by BAWC (Birders Against Wildlife Crime) and should be a very interesting day!